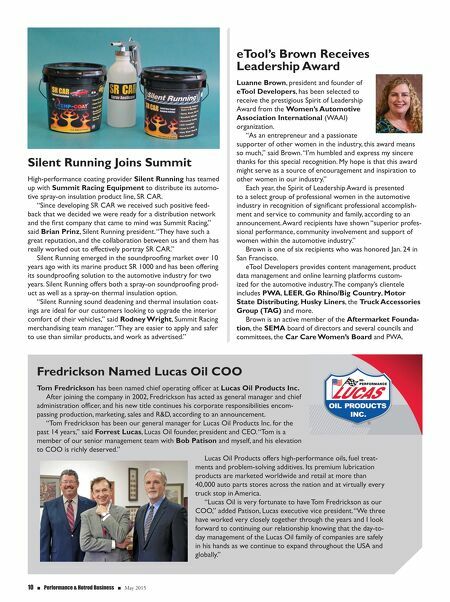 10 n Performance & Hotrod Business n May 2015 Silent Running Joins Summit High-performance coating provider Silent Running has teamed up with Summit Racing Equipment to distribute its automo- tive spray-on insulation product line, SR CAR. "Since developing SR CAR we received such positive feed- back that we decided we were ready for a distribution network and the first company that came to mind was Summit Racing," said Brian Prinz, Silent Running president. "They have such a great reputation, and the collaboration between us and them has really worked out to effectively portray SR CAR." Silent Running emerged in the soundproofing market over 10 years ago with its marine product SR 1000 and has been offering its soundproofing solution to the automotive industry for two years. Silent Running offers both a spray-on soundproofing prod- uct as well as a spray-on thermal insulation option. "Silent Running sound deadening and thermal insulation coat- ings are ideal for our customers looking to upgrade the interior comfort of their vehicles," said Rodney Wright, Summit Racing merchandising team manager. "They are easier to apply and safer to use than similar products, and work as advertised." eTool's Brown Receives Leadership Award Luanne Brown, president and founder of eTool Developers, has been selected to receive the prestigious Spirit of Leadership Award from the Women's Automotive Association International (WAAI) organization. "As an entrepreneur and a passionate supporter of other women in the industry, this award means so much," said Brown. "I'm humbled and express my sincere thanks for this special recognition. My hope is that this award might serve as a source of encouragement and inspiration to other women in our industry." Each year, the Spirit of Leadership Award is presented to a select group of professional women in the automotive industry in recognition of significant professional accomplish- ment and service to community and family, according to an announcement. Award recipients have shown "superior profes- sional performance, community involvement and support of women within the automotive industry." Brown is one of six recipients who was honored Jan. 24 in San Francisco. eTool Developers provides content management, product data management and online learning platforms custom- ized for the automotive industry. The company's clientele includes PWA, LEER, Go Rhino/Big Country, Motor State Distributing, Husky Liners, the Truck Accessories Group (TAG) and more. Brown is an active member of the Aftermarket Founda- tion, the SEMA board of directors and several councils and committees, the Car Care Women's Board and PWA. Fredrickson Named Lucas Oil COO Tom Fredrickson has been named chief operating officer at Lucas Oil Products Inc. After joining the company in 2002, Fredrickson has acted as general manager and chief administration officer, and his new title continues his corporate responsibilities encom- passing production, marketing, sales and R&D, according to an announcement. "Tom Fredrickson has been our general manager for Lucas Oil Products Inc. for the past 14 years," said Forrest Lucas, Lucas Oil founder, president and CEO. "Tom is a member of our senior management team with Bob Patison and myself, and his elevation to COO is richly deserved." Lucas Oil Products offers high-performance oils, fuel treat- ments and problem-solving additives. Its premium lubrication products are marketed worldwide and retail at more than 40,000 auto parts stores across the nation and at virtually every truck stop in America. "Lucas Oil is very fortunate to have Tom Fredrickson as our COO," added Patison, Lucas executive vice president. "We three have worked very closely together through the years and I look forward to continuing our relationship knowing that the day-to- day management of the Lucas Oil family of companies are safely in his hands as we continue to expand throughout the USA and globally."